How to Stack a Washer and Dryer. The new front-loading models of washers and dryers today are fine machines that save water and offer a variety of options for washing clothes. Stackable brands provide the option of placing the dryer on top of the washer for optimal utilization of available space. Purchase a stackable washer and dryer combination. It is recommended that the stacked washer and dryer be of the same brand and compatibility for stacking. Buy the manufacturer's stacking kit that is made for the washer and dryer that you bought. Using another manufacturer's kit or a homemade kit is not recommended--doing and will usually void any warranty. Follow the manufacturer's instructions for stacking the washer and dryer. Dryers are stacked on top of washers. Some kits require the removal of the dryer's legs and a foam backing be placed between the units. Have one person stand on one side of the dryer and another person on the other side. Have both people grip the bottom of the dryer, bend from the knees and lift the dryer. Place the dryer on top of the washer. Secure the dryer to the washer according to the manufacturer's directions. Most kits attach in the rear of the washer and dryer with the dryer sitting slightly in back of the washer. Attach the drain hoses to the washer, and the gas hose to the dryer for gas models. Plug in both the washer and dryer into the electrical outlets. Move the units into the desired position in the laundry area. Test the security of the units by running a test load and observing the entire washing and drying cycles. 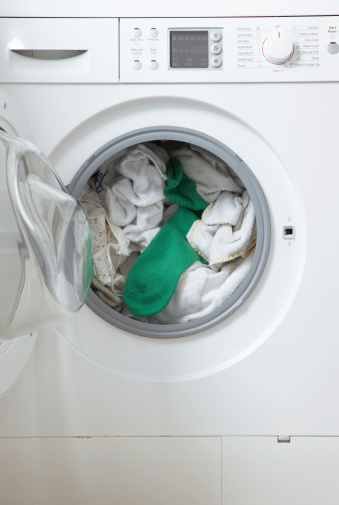 If the unit rocks or sways, the legs on the washer may need to be adjusted.